Forward-thinking designs, quality leather, a proven tree, and lightweight Cordura firmly elevate this saddle into a class by itself. The 7/8 position rigging is a favorite of all-around riders, allowing close contact between the horse and the rider. From the fleece-lined skirt to the leather padded stirrups, Fabtron's saddle makers got every detail right. Make your horse whinny with pleasure and treat yourself to a smooth ride. Super comfortable. Lightweight and superb quality! me. It’s super comfortable and light weight! I would recommend this saddle! This is my second Fabtron of this type and model. I purchased the first one almost six years ago and still ride in it almost every day. There is nothing about this saddle that I don't like. I'm a mature rider, and I ride Endurance on Arabian horses in the Southeast. I demand a lot from my horses.. and in turn, demand a lot from my tack, especially my saddles. This light-weight but sturdy, and remarkably comfortable saddle, checks all the blocks. The fit is true to form and the saddle holds up to extremes well. You won't be disappointed. Lightweight, nice leather, and it fits our hard to fit boy. We struggled to fit our older lightly swayback high withers little Arab. It fits perfect with a couple of extra pads in the pockets of the saddle pad (middle). Semi quarter rounded and short that fits perfect . Nice color! I purchased the fabrtron cordura round skirt trail saddle. 5 stars for the horse’s response to the saddle. 3 stars for everything else. The heat index here has been 100 and over every since I received the saddle a little over 2 weeks ago. So yesterday I finally tried it for about a 15 minute ‘ride’. 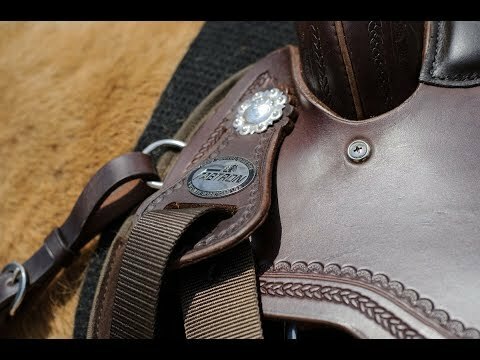 Had I known it would make this much difference in the way my horse moves I would have purchased this saddle years ago. My TB never wanted to maintain the lope, it was a short workout but he had no problem loping circles, instead of loping a few strides and breaking down to a trot, like he usually does. He even moves differently, he has a freer stride. The true test will come when I ride him longer, but for now I really like his response to this saddle. The description says the seat is extra padded, I’d like to know where, it’s does have padding but it’s still hard. Check the saddle when you receive it really well. I found a screw sticking out from the tree, about 1/8” it would tear the skirting over time if left the way it was. I contacted Fabtron and they told me how to fix it. My point, I shouldn’t have had to ‘fix’ this saddle. If this saddle is sold as a trail saddle, then they should have trail stirrups on it to begin with, or give you that option, instead of having to purchase them separately and then being stuck with an extra set of stirrups. This saddle weighed almost 24 pounds, not the 19 in the description. I Overall I’m pleased and hope I stay that way as I use this saddle more. When I purchased the saddle my horse had a leg injury so could not try it out right away. Now have been able to go out on the trails, some short rides and a few longer rides with steeper hills. Have been adjusting stirrups and have now got everything the way I feel comfortable with and seems to work fine now. My horse has high withers and narrow back, the semi quarter bars fit well and saddle stays in place well up and down hills. Have ridden 20+ years on Herford Tex Tan saddle and was worried about the comfort of light saddle. Finding it is very comfortable. I am 66 and my horse is 20 and am so happy with the light weight of the saddle I am happy I decided on Fabtron. I did quite a bit of research and read the reviews. I did replace the nylon straps with leather otherwise did not change anything. Nice lightweight saddle. Very comfortable padded seat. Good value for the price. Wish the stirrups were turned. The rigging seems to flow toward the back of the saddle- a little odd, but it still works. This saddle is still new to me but I'm pleased so far! These saddles are so nice, we own 3 of them and they all have held up so well. The close contact with your horse and the light weight, of these saddles is where its at!!! My first saddle, love it. Lightweight, looks good and very comfortable. Made minor changes, replaced stirrups for leather ones and changed the cinch. I take lessons on and trail ride different size horses from TB to AQH and the saddle fits great. Definitely would recommend. Comfortable for horse and rider. Lightweight, easy care. Great everyday saddle. this saddle is the very best quility and price, I own two other fabtros , they cant be beat! For the Brand, style and comfort plus the weight. Would this fit my high withered rocky mtn gaited horse? BEST ANSWER: I tried many saddles and found this saddle fit both me and my horse. I have a 15 year old quarter horse mare. Her withers have changed over the years and now hold a saddle quite well, no rolling. There is only one way to determine fit and that is to buy it with the option to return. Don't use the stirrups, replace them for trial and cover everything. You want to be able to return it in selling condition. That worked for me . Like I said, I tried many saddles. It fits my Spotted Saddle horse, and he has high, very narrow withers. I still have to add some padding so it will not slide back on his narrow withers, but it is certainly high enough to cause no problem. I love this saddle, it's so light and very comfortable. I have no problem with my Paint mare,enough room to reach in & pull her long mane out of the way. Great saddle, however, I changed the stirrups for a larger size. Has anyone used this saddle on a mule? BEST ANSWER: I use it on my Saddlebred cross, who is very narrow. It fits well with an thin wither pad used as well. For my broad backed QH mare, this saddle would be too narrow. But the quality of the saddle itself is excellent and it's very light to lift around and for my horse to carry. i have an 18 year old TB with pretty high withers. . . would this fit him? BEST ANSWER: We have bought 2 of these saddles and we love them. They are what we call a close contact saddle, you can feel what your horse is doing and yes to your question. I ride my quarter horse with one and my wife rides a appy with the other. We have also rode arabians, with these saddles we love them!!! I've used this saddle with OTTB and TBQH cross with no problem,. I love this saddle, it so light and comfortable. I'm taking it with me to England for the next 4 years. I might make one suggestion, I changed the plastic stirrups for leather ones just for looks. Made the saddle look better. BEST ANSWER: yes i believe it would. my twh is built the same way and it fits very well. BEST ANSWER: Yes they are, I asked a million questions of State Line and then Fabtron. I purchased this to fit my narrow Saddlebred mix and it fit well, as they said it would.